Hey everybody! Stéphane Oni Dèls, AKA The Drunk French Canadian is back! I don't believe I need to praise Dieu du Ciel! ; their beers and success speak for themselves, but I'll do it anyway. I know Cody loves them; last time he was in town we met at their Montreal pub with one of his friend, another beer nerd obviously more qualified than me. "No, Cody, when you're in town, nights don't end." To be fair, the night did end at some point, but only after a very late poutine. Just like my new friend, I too had work the next day, and I learned the harsh way the meaning of those words. But I am not here to reminisce nor talk about Cody's Montréal beercation (I mean, we all know he can do that on his own), so onto DDC and their beers. While I am scribbling (some would say what I do is more akin to hieroglyphs), this at my second home, a.k.a. my local pub, which I will talk about in a future text, I am drinking a fine Dieu du Ciel specimen: Pénombre ("Penumbra", meaning "twilight" or "darkness") which is their black IPA - easily one of my favourite style of beers. 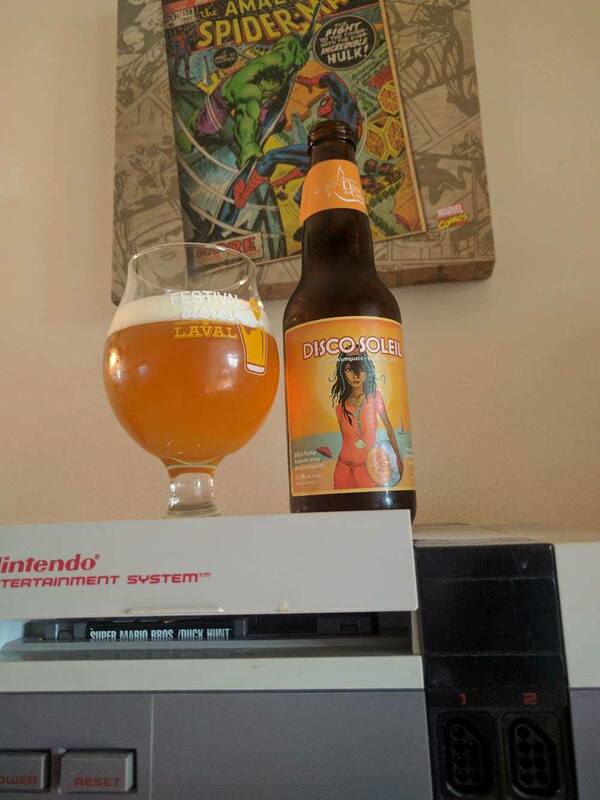 Instead, I will actually be talking about one of my favourite summer beers: Disco Soleil. This Kumquat IPA is a refreshing bitter joy. This not too fruity but sugary-bitter blonde bombshell blasts beautifully beyond buds, begging brain "bring beer by buttload". This fruity IPA is well balanced : fruitiness counters bitterness, refreshingness tramples the dryness of the ending, the only flaw I can find is that there seems to never be enough of it in a bottle! This is the perfect terrace beer, which just started opening here in Montréal, and we all know there's nothing better than a great beer after a long day of work (or play, there's no judging here). Disco Soleil is that - it's the easy drinking beer you want after a hot summer day, on your Friday night after a long week of hard work.. it starts the night easily. To be at bit more subjective, while I love this beer, usually a 6-pack stays in my fridge for a couple of days. This is a beer that has strong notes, most likely coming from the kumquats, and, at least for me, 2 or maybe 3 of these is more than enough in one siting. I usually buy a bunch of it when it comes out and then get tired of it until i randomly see it again throughout the summer. Then again, that's not very subjective, that's personal taste: one of my friends buys 6-packs of these every time he can, and drinks them all in one sitting. I guess you'll have to try it to judge it yourself! Like I (and most likely Cody) said previously; there's no point in praising Dieu du Ciel! ; their beers are almost perfect, but for sure this is one beer I wait impatiently for its release every year. Going back to my story, I can't remember which beer I had at the pub with my friends. It's almost a year ago, obviously I drank a lot (and drink a lot in general throughout the year), so it's hard to keep track. 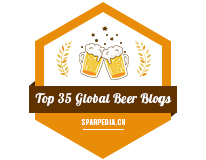 I could dig in my Untappd history, but that would be like looking for a needle in a hay stack. When you're blind.. and you lost both arms in a tragic farm equipment incident. 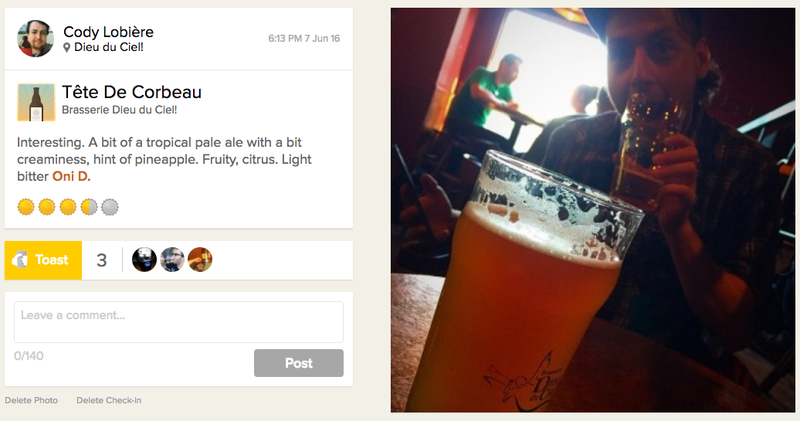 (psst, also follow me on Untappd! 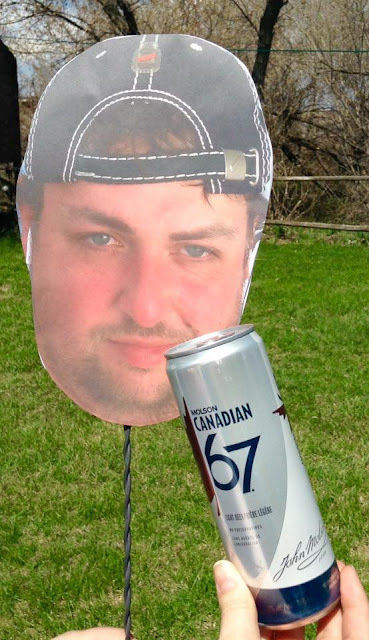 (@onidels) Oni Dèls, the Drunk French Canadian.